Where to Buy Cheap Moving Supplies? It is impossible to move without the right moving supplies, but you don’t want the cost of packing products to eat up your budget for moving in Melbourne. The solution is to buy your cheap moving supplies from Dawson Moving & Storage. Cheap moving supplies including; tape, moving or storage boxes, porta-robes, packing paper and bubble wrap can be purchased easily via the Dawson Moving & Storage online store. They have cleverly put together various moving supply packages to cater for any size move in Melbourne. In addition, they sell individual moving products at cheap prices and deliver them to your home for the ultimate convenience. The best thing about buying your moving supplies from Dawson Moving & Storage is that you have the option to buy second-hand moving boxes at a discounted rate. 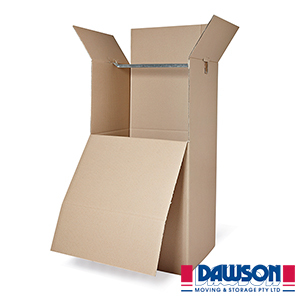 Unlike the used moving cartons you may acquire from friends, the second-hand moving boxes available at Dawson Moving & Storage have been sorted and wiped down so that only the strong ones will be sold. If you are on a tight budget, it is a good idea to buy you second-hand moving cartons from the professional removalists at Dawson Moving & Storage. There is indeed an art to packing your home or office properly. The right moving supplies will ensure that you are set up for a smooth move in Melbourne or interstate. If you make the smart choice to buy you moving products from Dawson Moving & Storage you can discuss your other moving needs with their friendly staff. Having moved thousands of Australians successfully into their new homes and offices, their experienced team can offer valuable moving and storage advice, tips and specialty services like a professional packing service. Dawson Moving & Storage aim to make every move in Melbourne and Australia-wide a positive experience, saving you time and stress. For cheap moving supplies and quality service, choose Dawson Moving & Storage. Call (03) 9763 0222.